Thea Colman, the designer behind Baby Cocktails is a person that is very dear to us. Her esthetic, instant classic designs and her sense of community makes her an indeniable force in the knitting world. Cables, textured stitch (Hello Milk Stout and Mezcal!) and yarns with a story are some of the things that drive her creative process. 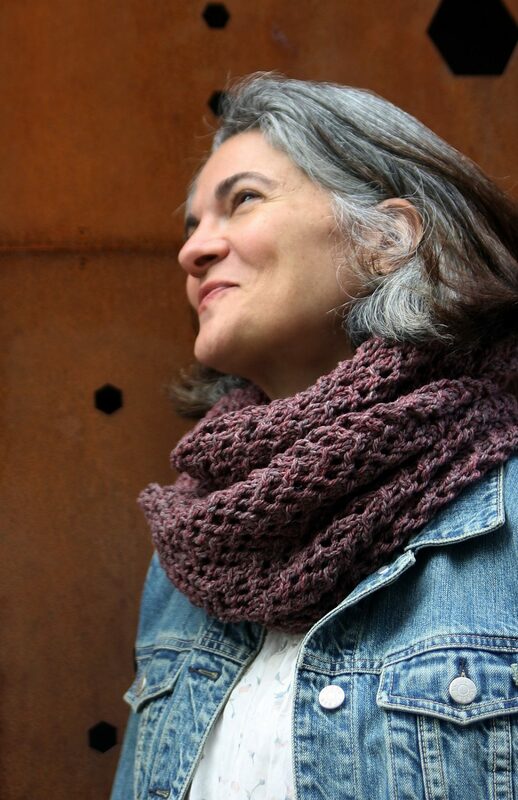 Lets hear about her most recent release, Hot The Top, designed in Nurtured Brocade and learn about her knitting journey and knitter personality. Tell us about this design? 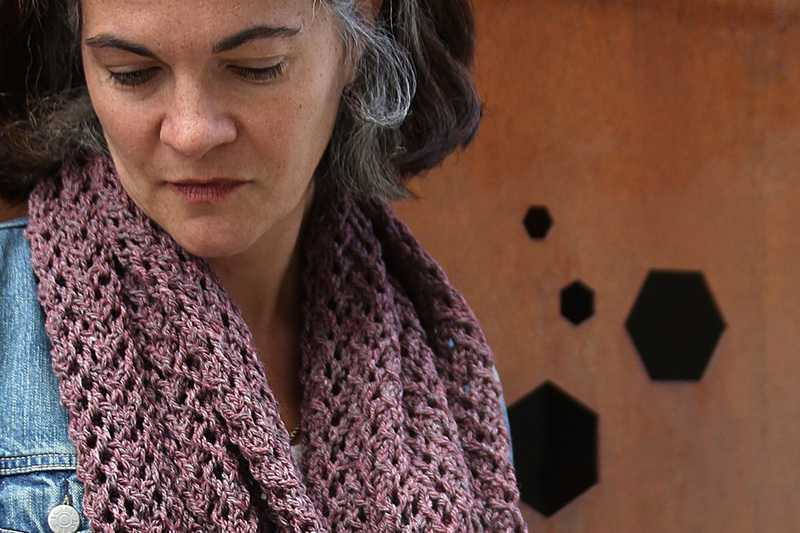 A cowl is one of my favorite accessories to wear these days, and it’s always a satisfying knit. Worn long in front, or wrapped around my neck, Hot The Top combines Julie Asselin’s Nurtured with bold, geometric lace. One of the special things about Nurtured are the flecks of various colors mixed into each of the colorways, and the subtle hints of green, gray and purple featured in this one show up beautifully in a simple motif. Simple lace allows the yarn to shine and big needles mean this knits up in no time — plus it’s one of those pieces that just goes with everything. What was your inspiration for this garment? Honestly, the yarn led me on this one. I had originally thought I’d make a big lace shawl, but the depth of the colors really wanted to kind of be the star, so I ended up going much more geometric and textural. How did knitting and later on design came into your life? My Grandma taught me to knit when I was young, and I took lessons in high school, but I didn’t really DO it until my children were small and found myself unable to sit still at things like playdates and swim lessons. I was knitting for fun – and unable to actually follow a pattern so I made things up as I went. I was unemployed for the first time since I was 12, and friends encouraged me to start writing things up. It all kind of fell into place after that. First thing you ever knit? I must have done rectangles when my Grandma showed me, but the first thing I remember is a salmon colored cotton top from a Katia brochure. I was pretty proud of it, and it was horribly 80s. What is the knit you have kept for the longest time? Your most meaningful one? I have the light pink/dark pink afghan my Grandma made me when I was small. My sister has a matching one in green and yellow. That answers both questions. My Mom also gave me a few baby sweaters she’d knit for me, but I don’t have the same attachment as I don’t really remember wearing those! Favorite type of garment to knit? Go to stitch pattern? Knitting gadget you cant live without? Right now, my Lykke needles. I have a set of short tips AND one of long tips. Conscious crafting is something very important to us, how do you apply it to your knitting practice? As a fairly well known designer, I realize I have the ability to bring eyes to small businesses and people who are doing things that I think are good for the world. 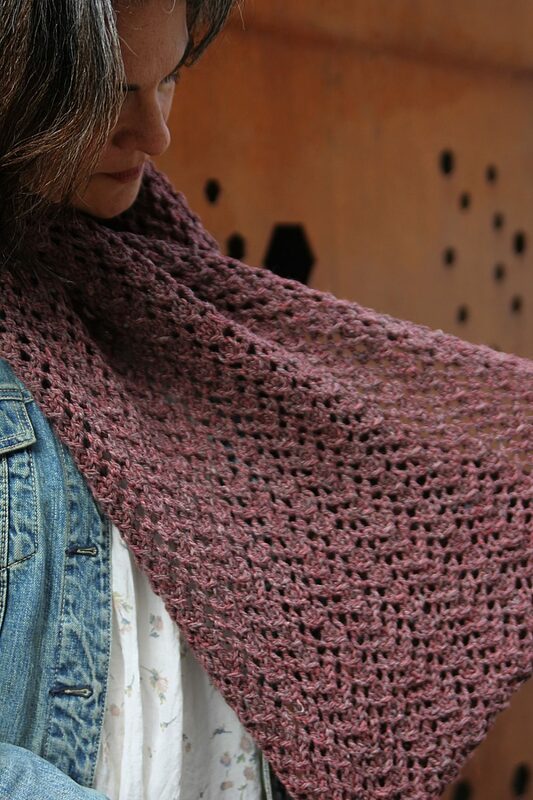 I’ve purposely tried to design in yarns that I believe in and work with businesses where I can make a difference. I can still do splits.